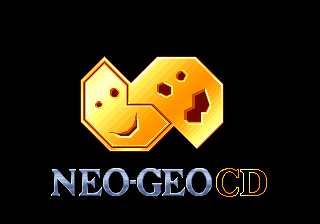 The Neo Geo CD was SNK's entry into the CD-ROM-based console era. Plagued by loading times due to its 1×-speed CD drive with inadequate CD-ROM cache, SNK would go on to release the upgraded CDZ model equipped with, depending on what source you read, a 2×-speed CD drive, or a larger CD cache size. The absence of any region-locking made the CDZ the preferred model for importing. Is the CDZ different enough to count as a revisional difference? 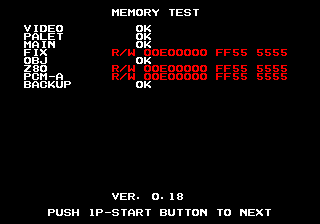 Pressing Up, Up, Down, Down, Left, Right, Left, Right, Down, Left, Up, Right, Down, Up, Down, C during the startup animation brings up a blocky "SNK NEO GEO" text display. No other function seems to be triggered with this sequence. This is not present on the Neo Geo CDZ. Holding Up + Left + B on any joypad during power on starts up the fast system test routine. 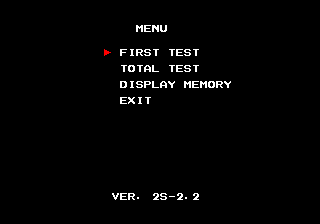 When done on a Neo Geo CDZ, a more complete test screen with menu appears. Holding Up + Down + Left + Right (normally impossible) on any joypad during power on starts up the complete system test routine. A normal Neo Geo logo jingle is present as track 0x02, but it's left unused. The normal Neo Geo CD jingle is track 0x30. This is not present on the Neo Geo CDZ, where it was overwritten with the used logo jingle. This page was last modified on 23 September 2017, at 09:11.